So You Think You Can Mom? : Hang Ten at Islands this Summer! Hang Ten at Islands this Summer! Islands Fine Burgers & Drinks has added some really yummy new menu items just in time to celebrate Summer with your family. 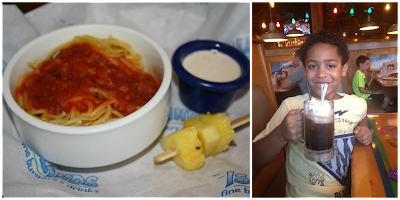 We have been dining at Islands Restaurants for years and we have always enjoyed how family friendly they are. My kids always order the same thing every time we go...until now! 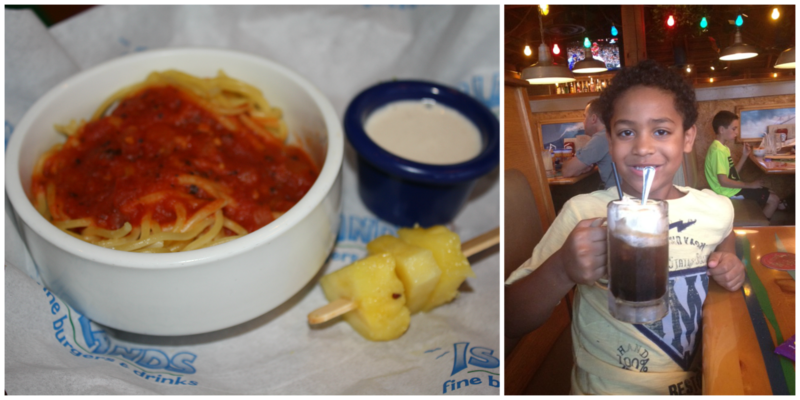 Islands has added new items to their Gremmie Menu that really got my kids excited to order. 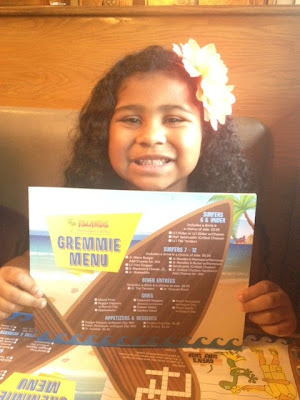 The new additions to their Gremmie Menu are sure to satisfy your little surfers of all ages. The menu offers items for Surfers 6 & Under as well as a section for Surfers 7-12. There is literally something for everyone! Mya ordered the Half Sandcastle, which is half of a grilled cheese sandwich, from the Surfers 6 & Under section that comes with one side dish and a drink. Islands has also added a bunch of new side dishes to the Gremmie Menu like Steamed Veggies, Fruit w/ Yogurt and more. Mya loves steamed broccoli and was excited to have it with her grilled cheese. Jackson ordered the Jr. Noodles & Marinara and said it was "so good that I'm going to order it from now on!". He picked Fresh Pineapple w/ Yogurt Dip as his side and it was the perfect bite of fruit for this surfer. Of course, he just had to have their Root Beer Float! My little guy wasn't ready to leave his Jr. Macaroni & Cheese behind so he ordered it again, but this time he asked for the Veggie Dippers w/ Ranch Dip which made this mama very happy. The Veggie Dippers include carrots, jicama and cucumber that we all helped him eat. Dad and I always order the Island Nachos and Buffalo Wings to snack on before our burgers come out. The buffalo wings have just the right amount of kick and even my oldest son likes them. This Summer, Islands also has a new line-up of Summertime Drinks to help celebrate our favorite season and beat that Summer heat. 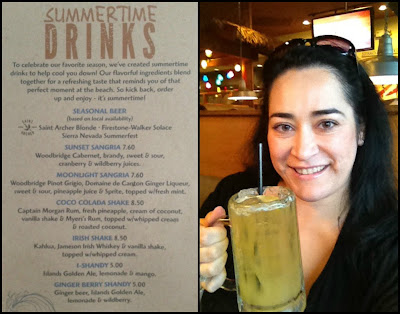 I tried the I-Shandy which is made with Islands Golden Ale, lemonade & mango. It was better than I expected it to be. So full of flavor and not at all strong so it's perfect for pairing with anything on the Islands menu. 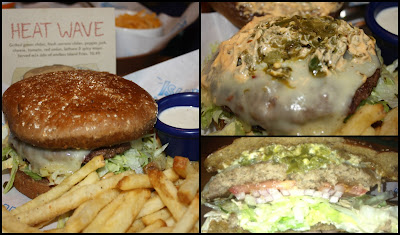 It was finally time for the main event...my Islands Heat Wave Burger! Islands has a dozen amazing burgers to choose from and the Heat Wave is lucky number 13! Loaded with grilled green chiles and fresh serrano chiles, this burger packs a punch that only a real burger lover will appreciate! The Heat Wave is topped with pepper jack cheese and a delicious chipotle aioli that you'll want to dip your fries in. I loved this burger and can't wait to bring my grandmother to try it for herself. She is the queen of spicy foods! If you know me, you know that no meal is complete without dessert and Islands has 4 tempting desserts to choose from. The Kona Pie was calling out to me so I had to order it. The slice is big enough for the whole family to share. This dessert is made with mocha almond fudge ice cream and a cookie crust topped with chocolate fudge, whipped cream, roasted nuts and a cherry. Yum...Yum...Yum! I've said this before and I'll say it again...it doesn't matter how nice your restaurant is or how delicious your food is if you don't have the right team supporting the brand. The restaurant manager, Joanna, was so warm and friendly. She hung out with us at our table and we shared some laughs. Joanna was very hospitable and remembered us from our previous visits. I love that! Our server for the night was Andrew and he was terrific! Andrew was so great with my kids and incredibly patient with us and all of our quirky requests. He even brought out a side of maraschino cherries for Jackson when Mya snatched the cherry off the Kona Pie and ate it! It is so important to have a strong team of smiling faces when it comes to customer service. If you're going to refer to yourself as a "Family Friendly Restaurant" then you better make sure you have employed servers that can maintain a smile and pleasant demeanor when it comes to kids. Islands has done just that. Great Food, Great Service, Great Memories!!! Disclosure: I was not compensated for this post. I was invited to try the new menu items in order to facilitate my review. These are just my two cents! I eat at Islands all the time. Best cheese burger and fries. We go Friday nights as our get away place. It is so full of life with the surf TV.